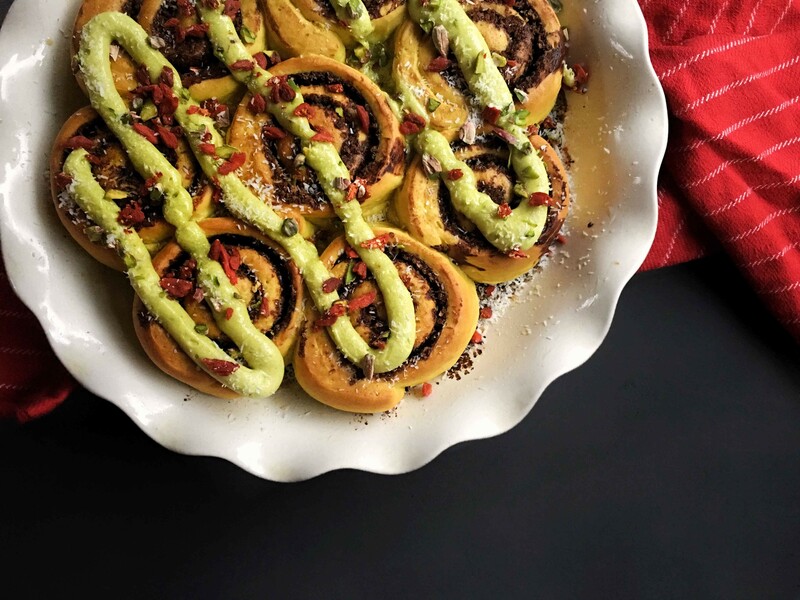 Move aside cinnamon rolls, there is another roll in town, one that can definitely hold it’s own against you, a much loved dessert! But for real though, I am a huge lover of cinnamon rolls, but it’s about time to switch things up. So let me introduce to you, the bounty roll! 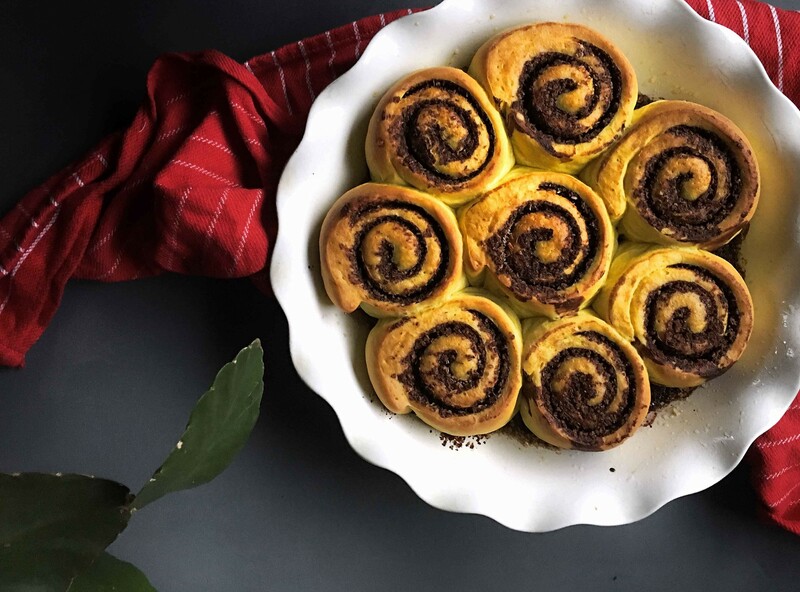 The name is quite self explanatory, these perfectly golden buns are filled with a coconut, cacao mixture and instead of using vegan butter as a filling, we of course used extra virgin coconut oil. 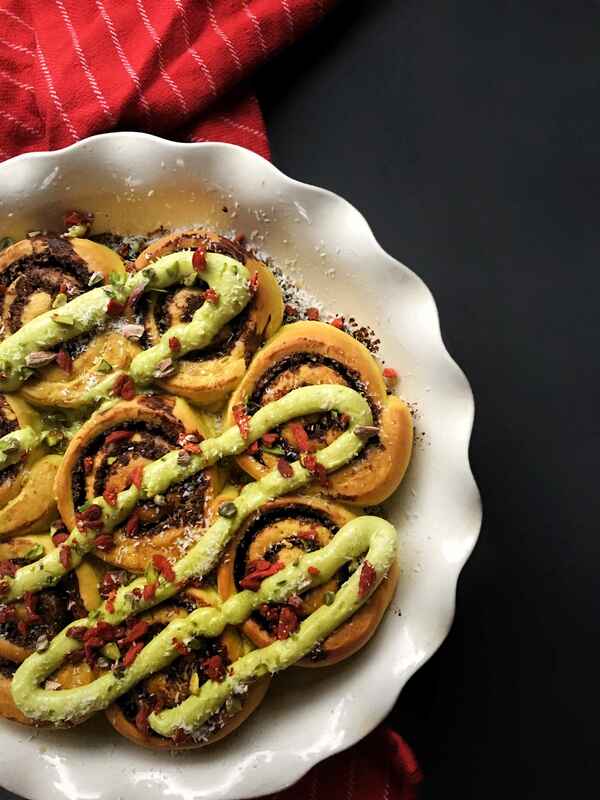 I was planning on sharing this recipe about 10 months ago when I served them at my birthday, but you know what they say, better late than never, right!? 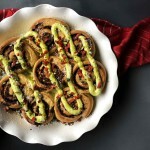 These rolls are perfect to bring to a holiday dinner or to serve on any other occasion to be honest, I often make these for family and friends, trust me, it’s a crowd pleaser. You can eat these bun’s straight out of the oven as they are or top them with whatever frosting you like. For this batch I made a simple vanilla “butter” cream frosting, by whisking about two heaping table spoons of vegan butter with powdered sugar, vanilla with a pinch of turmeric and spirulina for colour. 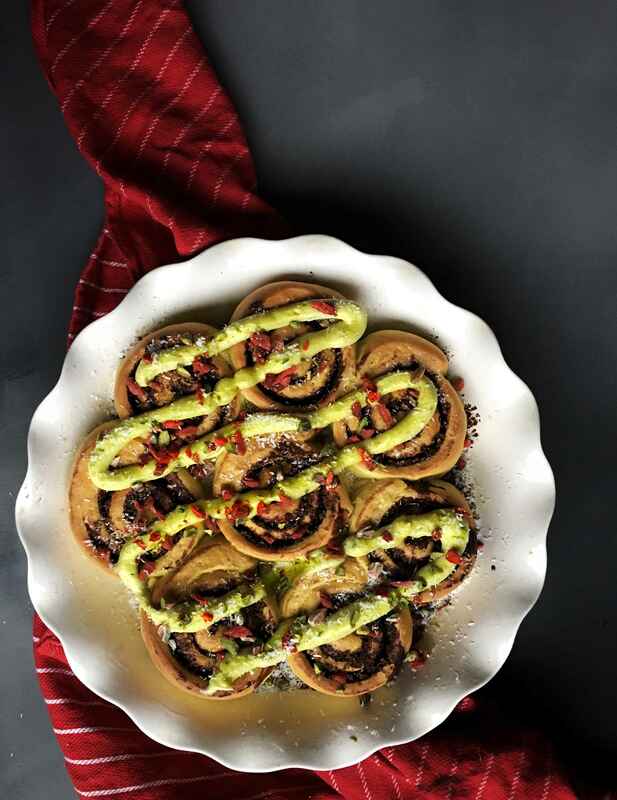 I also decided to top them with some crushed pistachios, goji berries and desiccated coconut for that extra festive look. 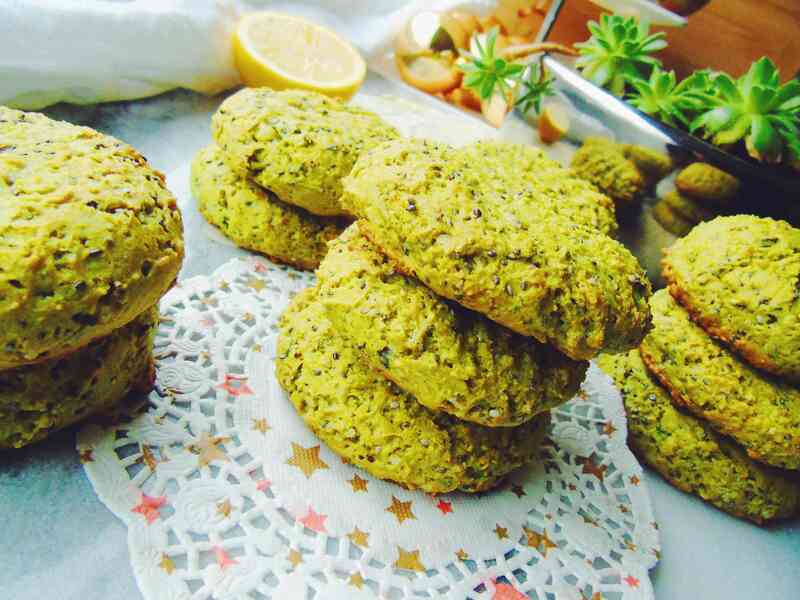 You know what’s funny, I’m just now noticing that lately the recipes have been sweet treats, don’t worry I’ve got something savoury coming your way! really hope you like this recipe, now let’s get to it! Feel free to leave a comment below or to tag me in your recreations on Instagram and don’t forget to like my Facebook page. 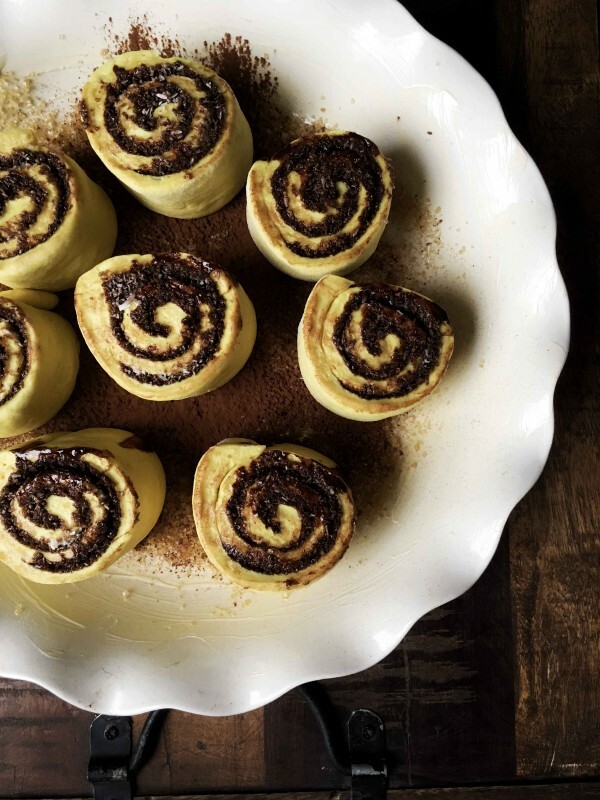 Fluffy rolls filled with coconut and cacao, it's a crowd pleaser! Start by blooming the yeast by adding the sugar and yeast to warm plant based milk. Note that the milk has to be warm and not boiling hot. After about 5 minutes the yeast should bloom and at this point you can add the melted coconut oil, turmeric and flours. 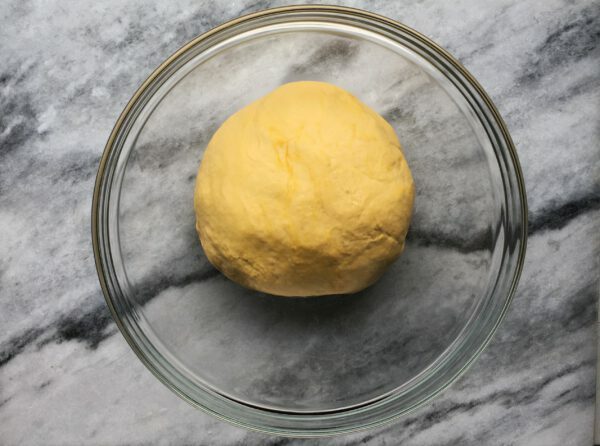 When adding the flour add half a cup a time and kneed until you get a nice and firm dough that doesn't stick to your hands. Now place the dough ball in a bowl and cover it so it wont dry out while we're letting it rest for about 45 minutes or until it has doubled in size. Let it sit at a warm place. After the rolls have doubled in size you can pop them in the oven to bake them for about 18 minutes, or until the tops are golden brown. You can easily eat them as is or top them with a frosting. Enjoy! We’re in the middle of the holiday season, but to be honest, I’m not really feeling it. There’s so much happening in the world right now, that I’m not really feeling the holiday spirit this year, which is fine by me. I might not be blasting “all I want for Christmas” by Mariah Carey from my speakers, but we will be making it festive in the kitchen. One thing food has the power to do is to bring people together and to put a smile on someone’s face. So don’t worry, these weeks will be festive, I might even catch the jingle bugs along the way! Aside from the holiday season we are in the middle of winter, if you live in the northern hemisphere that is, and one thing I associate with colder weather is tea, and lots of it! Now if you’d ask me for my favourite tea I’d say “a deliciously warming chai” but I’ve got a chai recipe in the works so for this recipe we are using another popular tea, earl grey. Growing up I was obsessed with London Fog’s, which is basically earl grey tea with warm milk and vanilla. 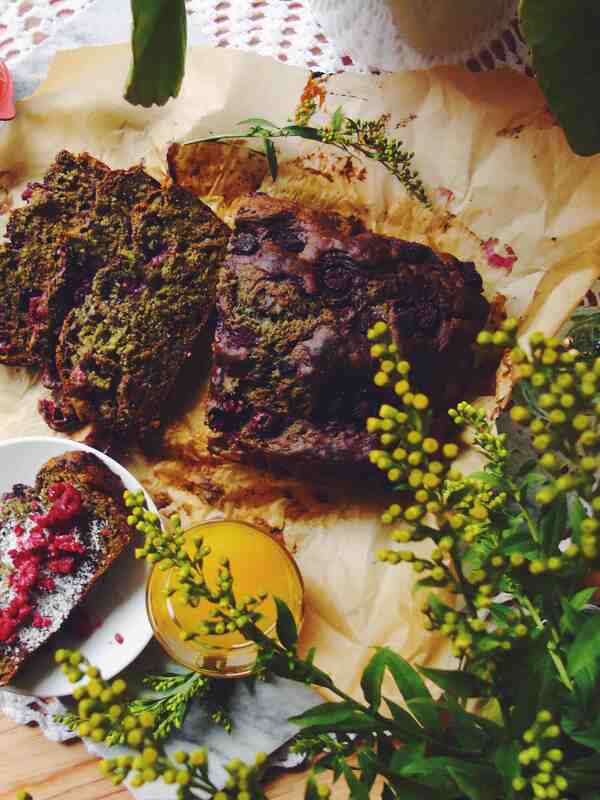 In this case we can speak of one plus one is two, why not turn a basically healthy tea into a indulging treat, because remember, were in the middle of the holiday season, so indulging foods are ok! 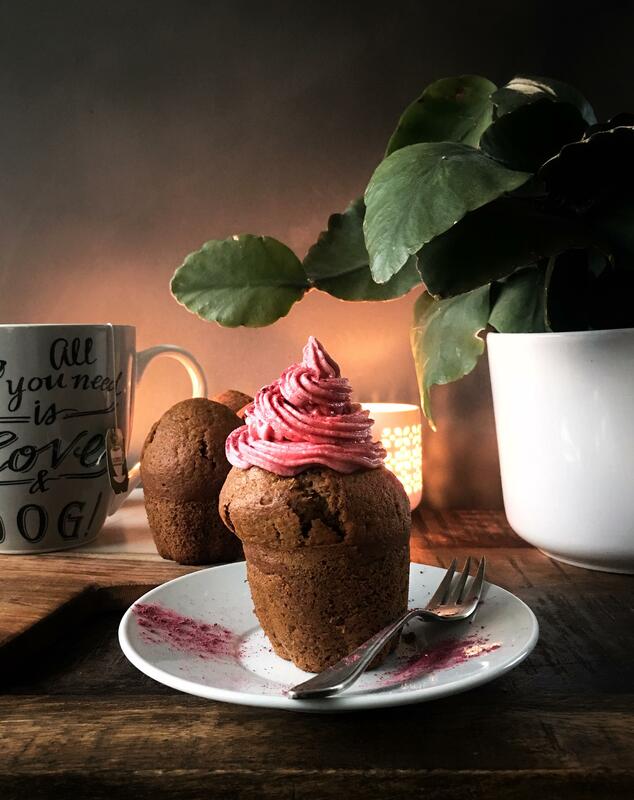 And if you want to make it even more indulging (which has become another word for disgustingly unhealthy, but yum) you can make a pink cinnamon/vanilla frosting to go along. 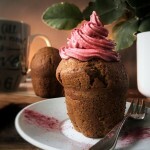 Just take a few tbsp’s of vegan butter and whip this up with some vanilla, cinnamon and powdered sugar until you get a nice thick and sweet frosting. To be quite honest, I was going to make an earl grey cookie recipe, but didn’t feel like putting in the extra work, so I decided to go with muffins. This is a testament to how easy this recipe is, I didn’t mix wet and dry separate and didn’t even bother making a flax egg, no I threw everything in a bowl and it worked out perfect! You can see it as a life lesson if you might, since sometimes we over complicate things, while sometimes we should just throw everything into a bowl and hope for the best. Now let’s get to it, pre heat that oven and make yourself some delicious muffins, and don’t forget to pour yourself a cup of tea to go along with it, or not if you’re not into tea. I hope you enjoyed this post, and feel free to leave a comment below, or to tag me in your recreations on Instagram and don’t forget to like my Facebook page. Start by preheating your oven to 175 degrees Celcius or 350 Farenheit. Open three tea bags of organic earl grey and adding this together with the sugar to a (bullet) blender. Pulse this until you get a fine powder. You can make a separate flax egg first, by adding about 4 tbsp of water to 2 tbsp flax meal and letting it sit for about 5 minutes. But you can also just throw everything in a bowl, like I did. Now grab a bowl and add the flax seeds, non dairy milk, butter/vegetable oil, agave, vinegar and vanilla extract. Whisk well and let it sit for about 5 minutes. After this you can add the baking powder, soda and flour and whisk until you get a nice thick batter. Grease 8 muffin tins and evenly distribute the batter. Place these on a baking tray and put them in the oven for about 23 minutes or until you poke them and the skewer comes out clean. Now remove them from the oven and let them cool before eating. Enjoy! This will be my third steamed bun recipe and I’m not even close to being finished. 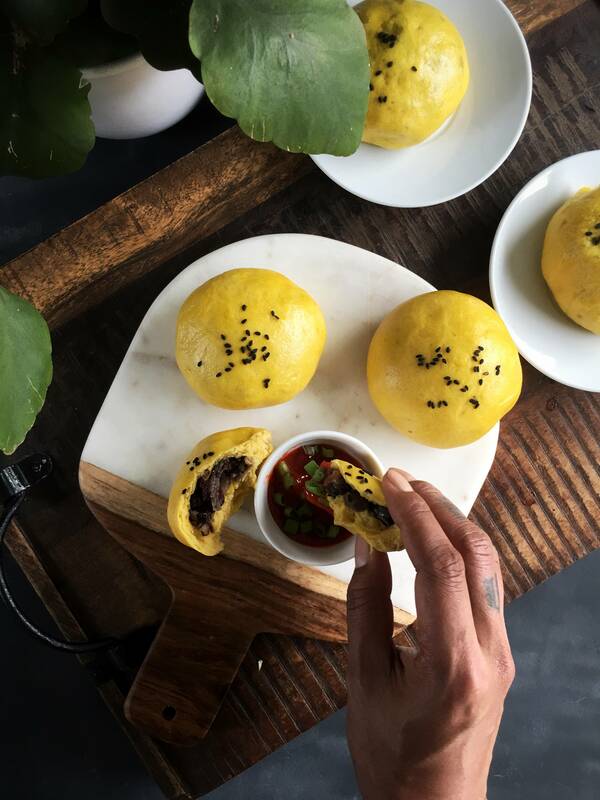 Now since where in the middle of the holiday season I’d like to give a twist to the regular bao buns with some sweet potato bun with a spicy bean filling, this one’s a winner! 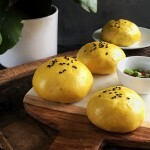 These buns are different from the other two recipes, which you can find here and here, instead of being open, these buns are closed and filled with a delicious spicy bean mixture. One of the reason I love steamed buns is because of the texture of the bread, it’s so soft and fluffy and because of the steam gets a nice and smooth “skin”. Adding sweet potato to the dough makes the dough a little sweet and adds a nice colour to the buns, to enhance the colour I also added a bit of turmeric, not only does this give the buns a lovely golden colour, it also adds to the nutrition of these buns, they’re basically super foods now, just kidding, or am I? All jokes aside my family loved these buns, and anytime a non vegan can’t deny the deliciousness of a vegan meal you know you did something right! 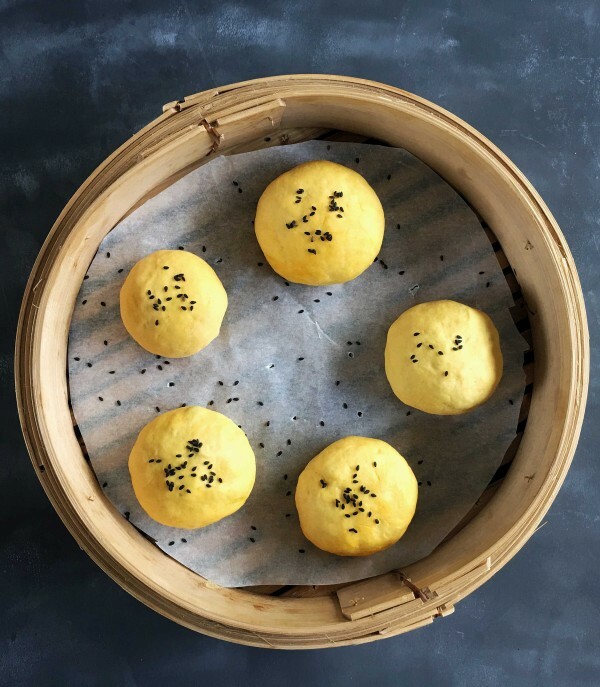 With these buns I’m paying homage to my Creole and Chinese roots by fusing the idea of Chinese steamed buns with a filling inspired by Surinamese cooking. The filling has celery leaves and adjuma peppers which are two ingredients often used in Surinamese cuisine and two ingredients I love working with. One to thing keep in mind if you can get your hands on the peppers and decide to use them is that they are very spicy so you might want to use chilli pepper instead or skip it all together. To simplify the recipe I just made simple round balls, but you can play around with the design while closing the bun to create a more authentic look. 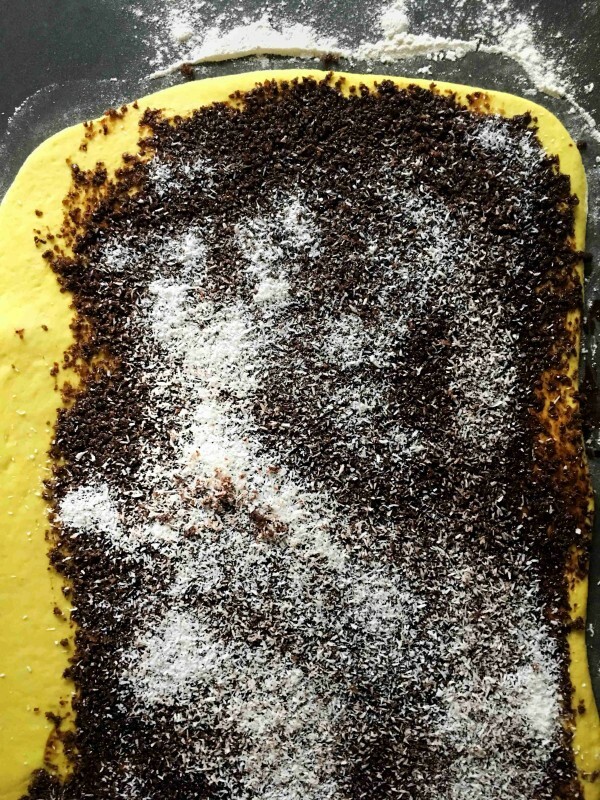 You can also play around with the filling and even the colour of the dough by adding different natural food colourings. 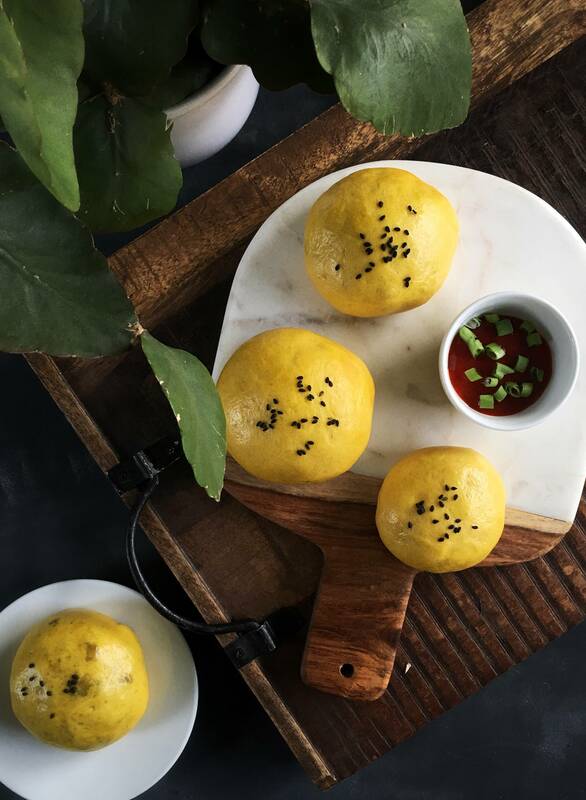 But no matter what you’ll do these bao buns will definitely have you asking for more! I’m currently storing a batch in the freezer and fridge to see how long they’ll stay good and if they’re freezer friendly, so once I’m done testing I’ll edit my findings in this post. For now go ahead and make some yourself, let’s get to it! A festive bao with a spicy bean filling. Start by chopping the onion, garlic and carrot. Sauté these in some oil on a medium/low heat for about 5 minutes (If you don't eat oil try using water). Now add the remaining ingredients and cook for about 10 minutes while mashing some of the beans in the process, this will make filling the buns a bit easier, while adding a nice texture to the filling. Add salt and pepper to taste and let the filling completely chill. To make the dough we start by activating the yeast. Take a bowl and add the warm water and sugar and add the pack of yeast. Now let this bloom for about 5 to 10 minutes in a warm place. 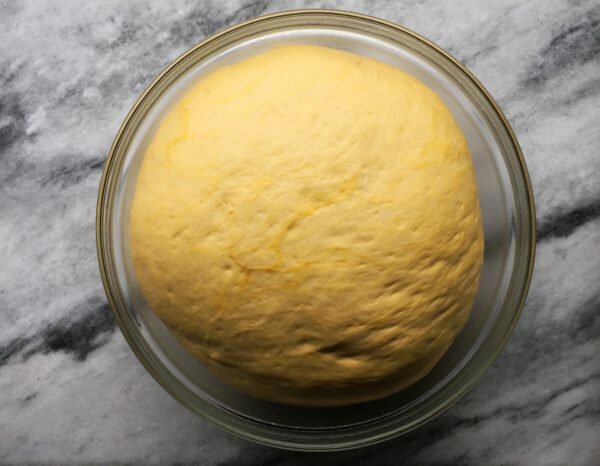 Once the yeast has bloomed add the oil, mashed sweet potato, backing powder and flour to the bowl and mix until you get a soft and dough. I let the food processor mix the dough for about 15 minutes or so. You can also kneed it by hand. During this process you can add turmeric to enhance the colour. Now add the ball of dough to a bowl, cover it and set it somewhere warm to let it rise for about 60 minutes. Once the dough has doubled in size take kneed the dough a little and separate the dough into little balls. Using a rolling pin flatten them out until about 1/4 of an inch and add a small table spoon of the filling in the middle. Now pinch to close the tops and roll it into a little ball. Add a piece of parchment paper in your steamer and place the buns on top. I used a large steamer so i steamed about 5 buns at the time, keep in mind that they grow inside the steamer. Steam the buns for about 15 minutes and they are ready to be served. Enjoy. I’m at a point that I’ve drifted so far from the original recipe of a sushi roll, that I’m not even sure if I can technically call this sushi, but what the heck!? let just call this sushi, I’m pretty sure it isn’t gimbap either, the sushi chefs will forgive me! 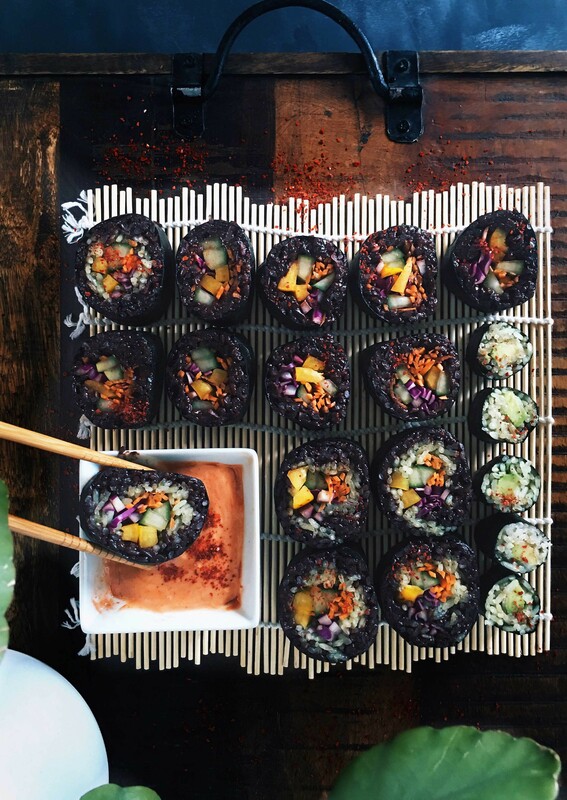 When it comes to “sushi” I love experimenting and coming up with new recipe ideas, it’s always a fun and yummy adventure, leaving my kitchen cluttered and my belly stuffed. 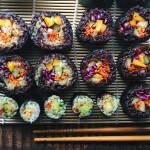 You can find some of my older sushi recipes through these links, for a rainbow sushi click here and I’ve also got a more tropical gimbap recipe over here. Now when it comes to this recipe I was inspired by heat, lots of heat! People that know me know I have a crazy tolerance for spicy food, growing up I would put cut up pieces of adjuma pepper on my bread and call it a sandwich (true story), at this point my stomach must be lined with sheets of metal. So its only natural that I had to come with a recipe for a spicy sushi roll, it surprises me it took me this long too make one! Knowing that I can take things overboard I kept these rolls hot but not insanely hot, you can always decide to skip on heat, or add some if you like your food hot and spicy. To make them spicy I used gochugaru which are Korean red pepper flakes, but feel free to try using chilli flakes! 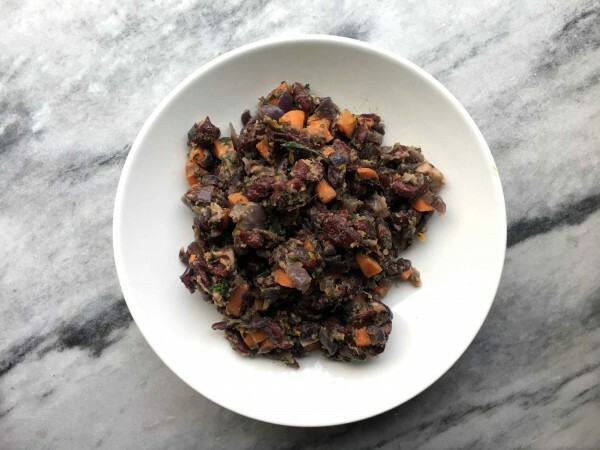 Another ingredient that should get some recognition is the black rice, which by some is considered the most healthy grain of rice, with a high amount of antioxidants, even more than blueberries. They have a unique chewy texture and get a bit sticky, which in my opinion works perfectly with the creaminess of the coconut milk and spices. You can have these rolls as is, because the rice is seasoned with garlic and onion powder, combined with the heat and sweetness of the sugar they are perfectly enjoyed on their own. Of course if you can add some heat by having some hot sauce on the side, if you are a true lover of spicy food you should definitely have some hot sauce on the side. I also had some simple maki rolls with simple short grained rice seasoned with sesame oil and filled with some avocado, because why not? Now its your turn to make these rolls and if you do feel free to leave a comment below and I’d love to see your recreations which you can show me by tagging me into your pictures on instagram. Wash the rice at least 3 times. Now add the water and the coconut milk to the rice in a pan and bring it to a boil, cover the pan and turn the heat to medium/low and let the rice simmer for about 30 minutes. You should be left with a sticky but not wet rice, if it is still to wet let it steam/simmer for another 5 minutes, making sure the bottom doesn't burn. Add the rice to a bowl to let it cool and add the hot chilli flakes, sugar, onion and garlic powder and mix to combine, using a wooden or rice spoon. 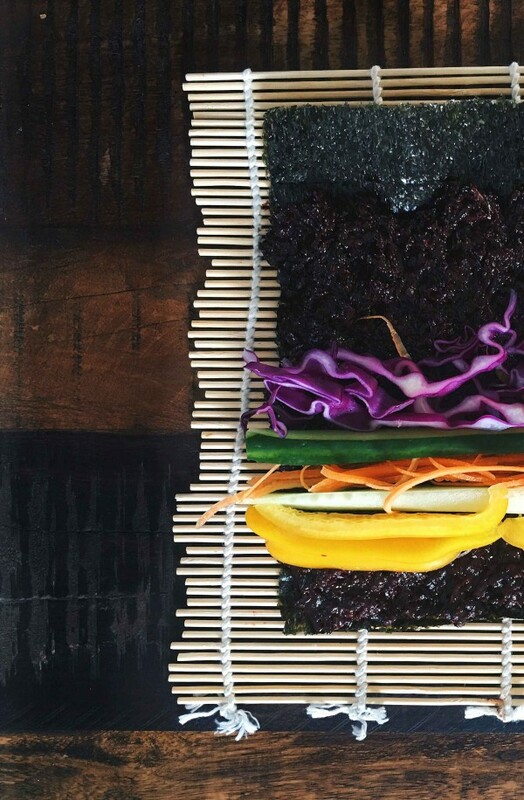 Once the rice has cooled you can place a sheet of nori (shiny side down) on a bamboo rolling mat or clean dish towel en place the rice on top of the nori leaving about one inch without rice, top the rice with the veggies and tightly roll to form the roll. You can wet the end of the nori a bit to make it stick. 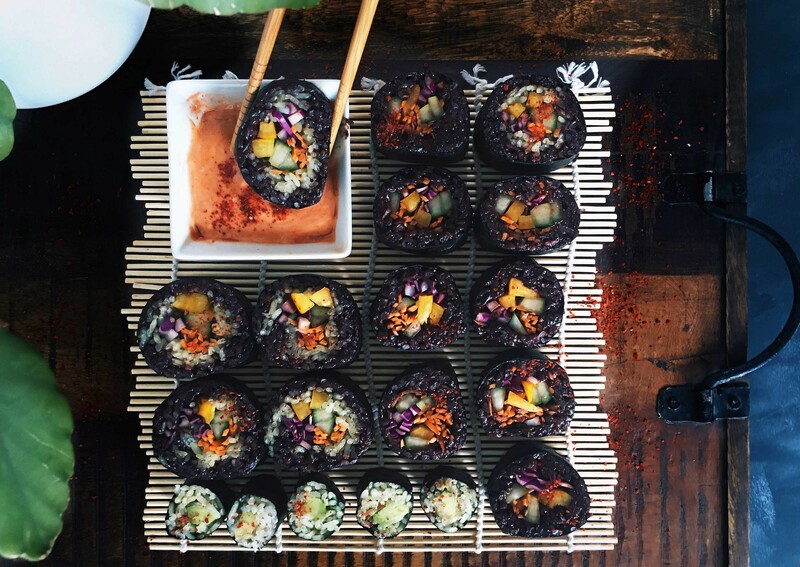 After letting them sit while you roll the remaining rolls you can cut them with a very sharp and or wet knife to make perfect slices. Enjoy.